Outdoor portrait of nine Prisoners of War (POW). 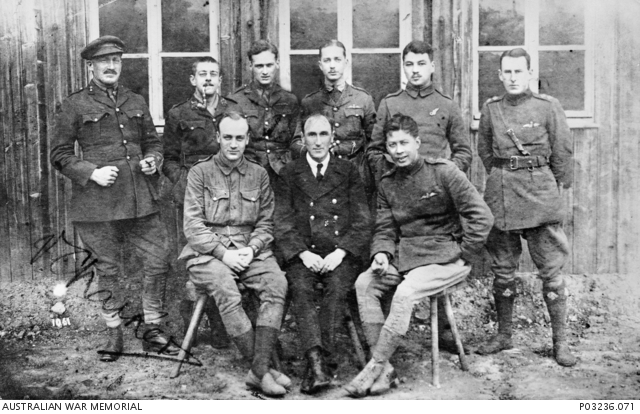 Identified seated on left is Lieutenant (Lt) Vincent William Charker, 20th Battalion, from Sydney NSW; standing on left is probably Lt Norman George Blanchard, 20th Battalion, from Sydney NSW. Lt Charker enlisted on 4 March 1915 and embarked for overseas on 25 June 1915 aboard HMAT Berrima. He was captured at Lagniecourt on 26 March 1917 and held as a POW until returning to England in January 1919. Lt Charker embarked to return to Australia on 28 February 1919. Lt Blanchard enlisted on 18 March 1915 and embarked for overseas on 25 June 1915 aboard HMAT Berrima. He was captured at Bois Grenier near Armentieres, France on 5 May 1916 and a notice posted by the Germans stated that he had died of wounds. He was later confirmed as a POW and eventually repatriated to Holland and then England, arriving in November 1918. Lt Blanchard arrived back in Australia on 16 May 1919. Of the other people in the image, there are four pilots and one observer, probably of the Royal Flying Corps. One of a series of over 400 photographs sent by Australian POWs in German camps to Miss M. E. Chomley, Secretary, Prisoners Department, Australian-British Red Cross Society, London. Original album housed in AWM Research Centre at RC00864, Album image number 98.